Charlton versus the school run: Should we start blocking off roads? We’re lucky in Charlton to have some very good schools. Our Lady of Grace Primary is lucky enough to have the newest school, having moved into just-completed buildings on Highcombe last month. Unfortunately, some of its parents could do with some lessons themselves. Back in 2015, when planning permission was granted, there were fears about the effects of parents driving to school on the streets around the site, which sits in between two other schools – Sherington and Fossdene. Now Highcombe is a mess at chucking-out time, with parents parking all over the pavement and even using the tiny Littlecombe cul-de-sac to reverse their cars. Greenwich Council says it will pass details onto its parking enforcement teams. Elsewhere in London, Camden Council is taking a different approach. It’s closing a road in Covent Garden during school hours to protect a primary school from traffic and parking. This was covered by Tom Edwards on yesterday’s BBC London News, while here’s a video from charity Living Streets. The issues facing St Joseph’s in Covent Garden are slightly different from ours in Charlton – it’s in the centre of London so there are a lot of delivery vehicles and taxis trying to get down the road, our streets are wider and more residential. The catchment for Our Lady of Grace may also be bigger. But our streets are still clogged by double-parking, bad parking, and traffic that really shouldn’t be there. It’s dangerous for children and other passers-by and adds to the area’s already poor air quality. We design out anti-social behaviour in housing estates, so why not our side roads? Already, we’re seeing a couple of Charlton streets closed for a couple of hours on odd days to encourage children to play out. Should we be doing the same in Highcombe, Wyndcliff Road and Sherington Road to help them get to school safely? 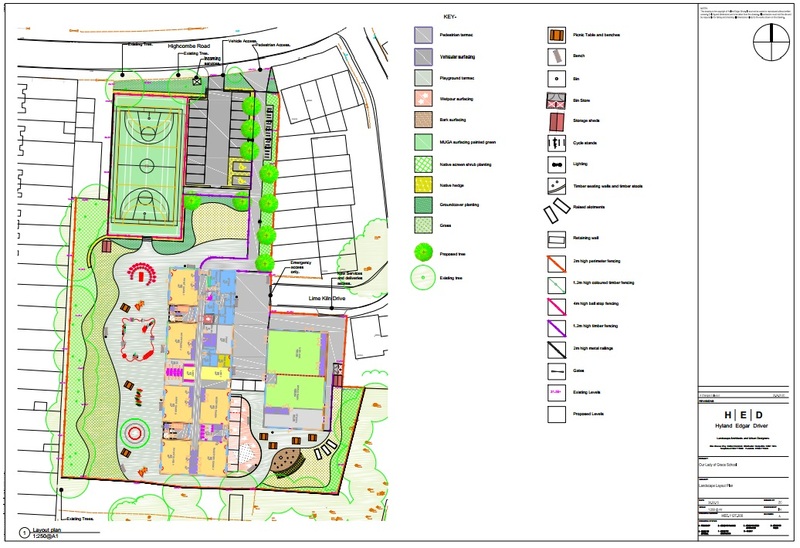 Our Lady Of Grace school on Charlton Road has submitted a revised planning application for a ‘two form entry primary school‘, to be built on the long-disused playing field off Highcombe, below their current premises. The key difference from their previous – rejected – application, appears to be that the main entrance to the school would be from Highcombe, rather than Lime Kiln Drive (though the cul-de-sac would still house a service entrance and emergency exit). Charlton Community Gardens have raised concerns about the loss of land that has been designated Community Open Space in the council’s local plan. There’s an open meeting at Blackheath Rugby Club to discuss the plans on Monday 22nd June, starting 7pm with a presentation of the plans. The latest plans and documentation can be found on the council’s planning portal: search for application 15/1225/F, or “Highcombe”.